All Circle of Light paperback books may be purchased through amazon.com. PLEASE NOTE: After you order your digital media (audio download or ebooks), you will be sent an email. It will come from digitalproductdelivery.comand it will have the link for you to click to get your download. Please look for this email. If for any reason you don’t get it, please check your spam/junk folder before contacting us. But if for any reason you don’t get your download, please know we will make sure that you do! SAY YES TO LOVE, GOD LEADS HUMANITY TOWARD CHRIST CONSCIOUSNESS. This volume of the Messages from God from mystic Yael Powell’s 35 year communion focuses on the creation here on Earth of a consciousness of Love and only Love. We see that we have been living in a world of duality in which there has existed Love and other than Love. The Messages show us that this is an illusion. There is nothing anywhere but Love. Anything else that we see is mis-perception or humanity’s mis-creation. We learn to direct our thoughts, to shift from the ego to perception from the heart and to become a force for transformation to unity. We are given the tools to make the changes that will bring forth the living Christ in every human heart. This inspiring second collection of Messages from God about consciousness lifts us to a new level of intimacy with God and ever-deeper connection with the Twin Flame in consciousness. Are you ready to be a transforming heart in these dynamic, Earth-changing times? Circle of Light offers MESSAGES FOR THE HEART OF LOVE, an exciting E-Book of Messages from God in which God lifts us to the highest resonance. At the same time, the Messages address some of the most challenging questions asked by LightWorkers on Earth at this time, such as the use of the Law of Attraction, the role of forgiveness and the effects of our daily decisions.MESSAGES FOR THE HEART OF LOVE directly prepares all of us for the Shift to the Heart that is changing our experience of life, right now. The title addresses each of us. WE are the Heart of Love. As always with the Messages from God, the power lives between the lines in the packets of Love for which the words are carriers. If your life is too busy to read full Messages from God, read PASSAGES… High impact PASSAGES from the Messages from God bring you immediately into the full experience of who you are as the Heart of God! Powerful and dynamic, these PASSAGES hold a resonance that is undeniable to the heart. Read them by themselves or as a companion volume to MESSAGES FOR THE HEART OF LOVE. Begin your day with a few moments of Spirit’s direction. Pose a question, open a page and see what God reveals. Choose a random PASSAGE for inspiration at a challenging moment. Give yourself (or someone else) this (literally) timeless gift of PASSAGES. In 1986 Yael and Doug Powell received the first information about the enigmatic topic of SoulMates through the Messages from God. Over the years as they have grown with God’s teaching, the information about SoulMates through the Messages has greatly expanded in scope and detail. These provocative Messages from Yael’s communion with God, the first book published by Circle of Light (2001), reveal radically new and fascinating information on the God-given natural gift of the SoulMate or Twin Flame. The Messages confirm that each of us was created with a Twin Flame at the Moment of Creation and explain that the innate yearning we all have for a perfect partner is based on spiritual truth. This book opens the heart and tells how to draw your Twin Flame through meditation and heart connection to experience the bliss in relationship that is our birthright. To our knowledge, the SoulMate/Twin Flame teaching as given forth through the Messages at Circle of Light, has not appeared before on the planet. It returns Love and Sacred Sexuality to a key place in our lives, and demonstrates the importance of understanding the Twin Flame for a transformation to Love in our entire world. A classic. This important companion book to GOD EXPLAINS SOULMATES brings high resonance understandings of the Love of the Twin Flame and the role of sexuality on Earth between SoulMates. 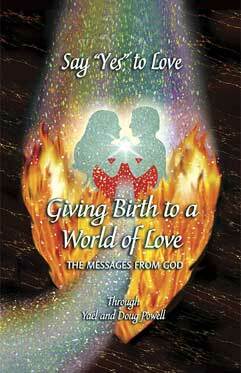 This book is ssential reading for couples making a sacred commitment. It reveals the truth of the vast and high vibrational nature of the SoulMate or Twin Flame and the astounding potential in the atomic power of Sacred Sexuality. Those who desire to reflect their Twin Flame through a relationship on Earth and who are able to come together in highest intention can experience profound ecstasy, while the giving forth of their Love can transform the world. Likewise, God explains that beyond physicality, connection with the Twin Flame in consciousness, through the heart, is a powerful avenue for being the heart of God here in Earth in this transformative time. Those who desire to reflect their Twin Flame through a relationship on Earth and who are able to come together in highest intention can experience profound ecstasy, while the giving forth of their Love can transform the world. Likewise, God explains that beyond physicality, connection with the Twin Flame in consciousness, through the heart, is a powerful avenue for being the heart of God here in Earth in this transformative time. Eternal Twin Flame Love provides a fascinating, intimate revelation of a profound eternal Love with one partner in physical embodiment on Earth and the other in an ethereal dimension. This amazing inter-dimensional Love story, meticulously documented, captures the divine essence of SoulMate union and opens a new pathway for Twin Flame Love. ShannaPra’s story creates a bridge, a template for relationships in consciousness, through the heart, in this time of transformation on Earth. This is a Love story that will bring hope to every heart on Earth. It is recommended as a demonstration of how to connect with the true Twin Flame within, through consciousness and the heart, the prerequisite for reflection of the Twin in a body on Earth. Jeshua shares with us his feelings from the very elevated viewpoint natural to him, as his life on Earth unfolds. Narrated in the first person with chapters by Mary Magdalene as well, Jeshua chronicles in detail his childhood, his passionate Love and marriage to Mary Magdalene and their travels and mission of anchoring Twin Flame Love on Earth. This story brings the awakening of the Feminine Christ for this Age. This is the Christ story as never before presented — a deeply personal, heart-warming sharing of the highest resonance that rings true in every sentence. Yael Powell is a universal communicator and has received many messages from animal and plant beings. This masterpiece of animal communication presents a collection of messages received over many years from her special companion, Magic Cat, an animal Master. Yael has always had many animals. Magic was originally a stray cat who came to Yael in a very dramatic way. He would jump on the screen door of the house and make noise until someone fed him. He became so obnoxious that at night Doug closed him in a shed so that they could sleep. Finally, Yael, who never refuses an animal, let him inside the house. He climbed on the pillow of her bed and they fell in Love. From that time on Magic was well behaved and Yael’s darling. It was no accident that he came to Yael because he was a very evolved cat, in fact, an animal master, as you will see as you read this book. In this compilation of his messages, Magic brings us insights about the Web of Life, Sacred Sexuality through the eyes of a cat, our “loopy” minds, death, the difference between animals and humans and many other topics. Magic shifted from his stray body into a beautiful Ragdoll body a few years back, but then decided to leave for the realms of consciousness. He is ever in our hearts. If you love animals and have ever wanted to communicate with one, you will love the candor and beauty of this volume. 'going out on a limb'..."
stirring to the core of my being. reading them but my heart." messages are the road home." "Oh, my dear friends... I just finished Magic Cat Explains Creation last night and I can only say, Wow! I wept for the first 100 pages. Yael and Doug Powell of the Say YES to Love books have once again been pure conduits for a most profound message of Love! Magic Cat's messages through Yael are deeply insightful and touch the very altar of the human heart! "I have yet to meet a soul upon this planet whose life has remained untouched by the divine love of an animal. Almost every spiritual tradition has promised that one day the animals would communicate with us. At long last, the time has come. Magic Cat's wisdom and spiritual vision will have you weeping too in recognition of the truths he's shared. Thank you, thank you, dear Magic Cat (although I'm sure he has received my gratitude already through the ethers)." "This is the most beautiful book I have ever read. My tears were soft and sweet for our beloved nature allies. Can you imagine? Magic Cat's voice is brilliant and true. Yes to animal communication! "All the years I have looked into my cat's eyes and wondered what they were perceiving--knowing he was alive to the mysteries of the universe--a true messenger. Together we shared a sacred place. With a silent gaze and visits to the place of one shared breath, I wondered how to get 'there' from 'here.' Our silent heart embrace is in this book. Not with thinking but the book provides a real experience into OUR own truth. "Thank you for showing me what my cat has been shining within his emerald/golden eyes--glittering worlds that HE is a master of. Now I know how I can begin to truly listen and hear him. Magic Cat teaches of the Real World that calls us home--It is our birthright. It is accessible. I am claimed by Nature Spirit as daughter once again. WE ARE. Animal Lovers Unite! This proves what we always knew was true. We are not the only say in this deal...silly humans. Thanks Magic Cat. I respect your words. I love you!" "I have been reading the beautiful book that Yael and her Magic Cat so co-transparently parented into print, and it has left soft radiant pawprints and purrs in my heart. This particular book has reached me, or I have received it, most deeply of all Yael's published works to date. It touches me in a primal place and I will be savoring and sharing it with others for some time to come. I like to read it with our cat, Dougal, curled up on the bed near to or nestled next to me. I would have previously written "asleep next to me," but this book has awakened me to the fact of his presence (Being-as-Dougal) whether his eyes are open or closed. I'm grateful for this book, which is a cat-chment place of great treasures on so many levels for us All." "Jesus and Mary Magdalene: The Eternal Heart of Love is an exquisitely integrated expression of affirmation and praise for the holiness of our mortal lives, our sexuality and of Mother Earth. At the same time, it is a love song and a bridge to the infinite realms of Spirit. It's all there in one unifying ecstatic hymn of joy and most vibrant divine awakeness. I believe it will inspire many hearts, and will help free readers from limiting concepts of Christ and of our sacred intimacy with one another." "I just finished reading The Eternal Heart of Love and wanted to say thank you dearly for doing your work to bring us this masterpiece. It is the best book I ever read. I laughed, I cried, I felt joy and passion among many things as I related my own twin flame experience. God bless always." "This book just has to soar. The energy of the Jeshua/Mary book has a living light of its own! I'm astounded. No words to describe. I am deeply appreciative of its energy and what it took to bring it through. The world changes when I read it to a living truth, very present, very now." "This is the most beautiful book I have ever read! It is of such a high vibration that I could feel the difference with all the density and heaviness that's been keeping me down. It is so much above any earthly vibration that I could feel myself lifted up to a purity I've never sensed. Yes, the word that comes to me is 'purity,' love described in the purest form ever! It truly is the perfect book about the perfect love. I feel that for the first time I really understand Jesus' mission on Earth, and not only that, but I understand my own purpose for being here."